Custom Outdoor Living Creations from the Springhetti Group. 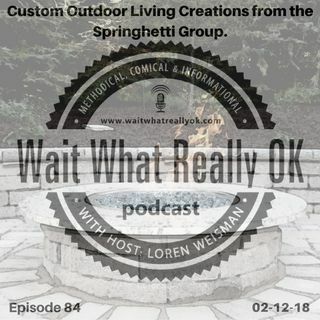 Wait What Really OK Podcast Episode 84 hosted by Branding Strategist and Keynote Speaker Loren Weisman talks with Dan Springhetti of the Springhetti Group about the backyard sanctuaries he builds for families in Wisconsin and Florida. The Springhetti Group delivers custom outdoor living creations by designing and creating personalized backyard sanctuaries for your home, your life and your story. By first learning about you, your ... See More needs, and your story, the entire project and process results in a personalized and individualized backyard for every client. The Springhetti Group views each phase and step of a project as part of the whole. While the goal is the best end result, we desire every family to enjoy the process from start to finish. Every person has a different story, different needs and different desires for their life and their home. The Springhetti Group looks at and looks into that story to help author all the options that would fit best to create the custom outdoor living creations that would turn that yard out back into a backyard sanctuary. Episode 84 of the brand management and marketing podcast Wait What Really OK is titled Custom Outdoor Living Creations from the Springhetti Group and features Dan Springhetti. The show is available on iHeartRadio.